Dr. Seuss Birthday Party! 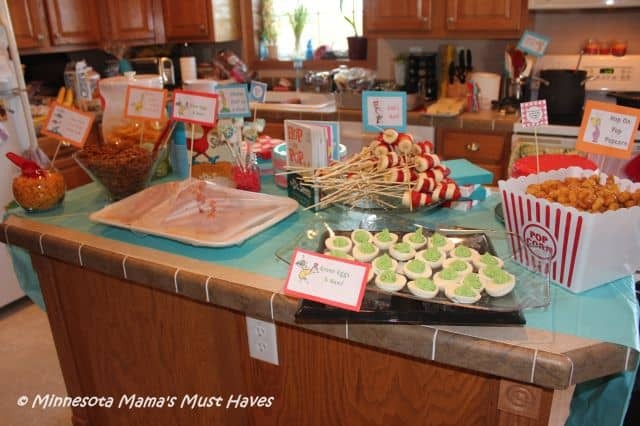 Dr. Seuss Party Food Ideas, Games, Decor, Favors & More! This weekend we celebrated Carson’s 1st Birthday as I shared with you yesterday. I went ALL OUT with the Dr. Suess theme! It was so much fun I just couldn’t resist going a little over the top. There are SO many ideas that you can do with it that they just kept coming to me! 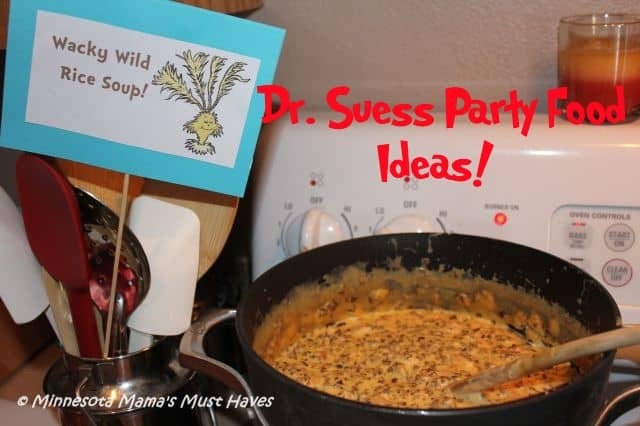 Here are a TON of Dr. Suess Birthday party ideas and Dr. Seuss party food ideas for you to pull from 🙂 I even have printables for you! Keep checking back this week as I post the food recipes too! 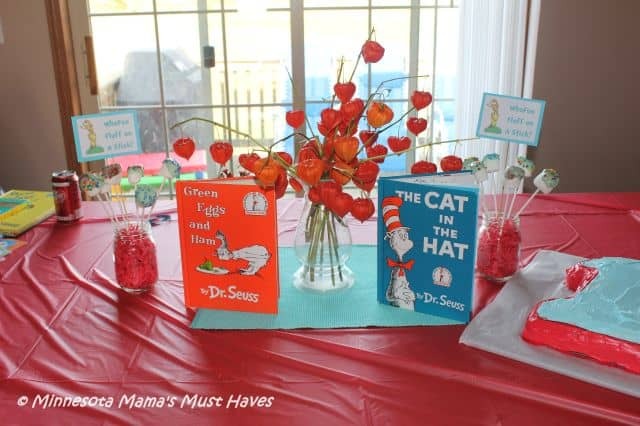 I wanted the Dr. Seuss theme to emulate through to my guests from the moment they walked in the door so I set up this brightly colored table full of Dr. Suess inspired goodies! It was so bright and colorful! From the moment you entered the door you felt the theme of the party. I thought the Chinese lantern flowers looked “Seussical” so I used them, along with Dr. Seuss books , to decorate each table. 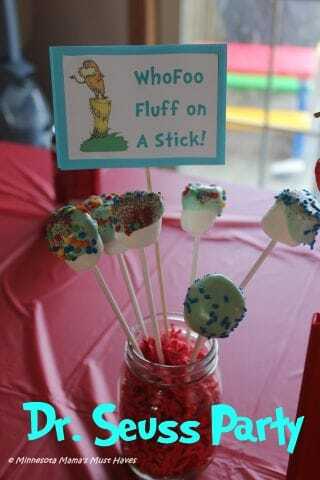 I also added some jars of WhoFoo Fluff on a Stick to add to the fun! I went with a red and turquoise blue color scheme which I just LOVED. I was able to find the table cloths, napkins, plates, cutlery, balloons, etc all at Walmart for very inexpensive prices (most at 99 cents!). I used blown up balloons with matching curling ribbon and hung them from the ceiling above each table to create a balloon chandelier. I also added in paper lanterns in the red and turquoise colors which looked great. There wasn’t any food on the table that wasn’t Dr. Seuss inspired. Everything had a theme and followed the books of Dr. Seuss. 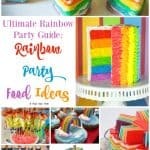 My guests just loved it and it was a huge hit! I created my own food labels using Dr. Seuss fonts and graphics and printed them off and glued them to card stock on picks so I could put them in the food. 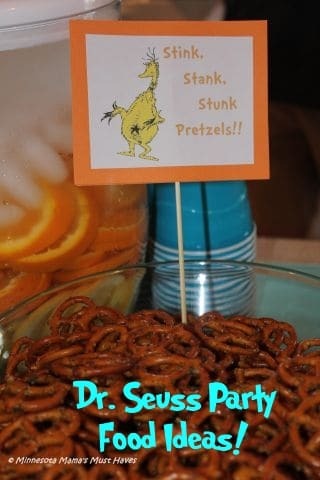 Get my free Dr. Seuss food sign printables, fonts and more by clicking the link! Then print them off, add a Dr. Seuss character sticker and tape them on to cardstock . 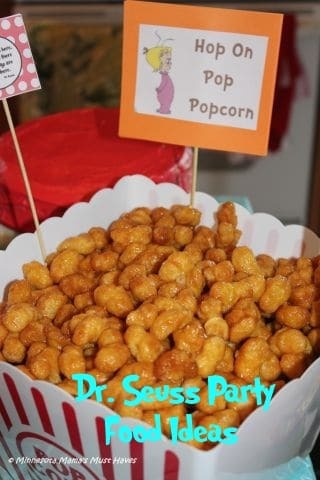 You can also get all of my Dr. Seuss party food recipes by clicking the link. 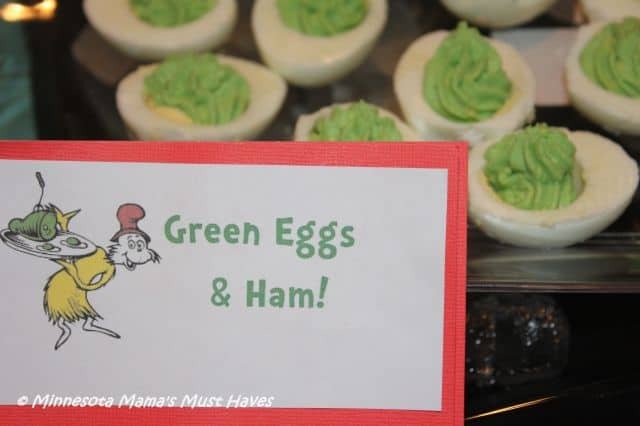 Of course we had to have green eggs and ham! They turned out great and I was surprised to see all 48 deviled eggs gone in just an hour! They were a big hit. I was worried no one would eat them because they were green but people loved them! I made a ten pound pineapple ham and cooked it in a bag (which worked great!). It was SO good but apparently too good because we ran out! 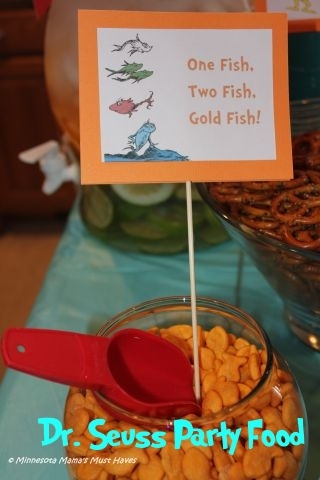 Sticking with the Dr. Suess theme we had One Fish, Two Fish, Gold Fish! The Hop On Pop Popcorn was also a huge hit and was gone! 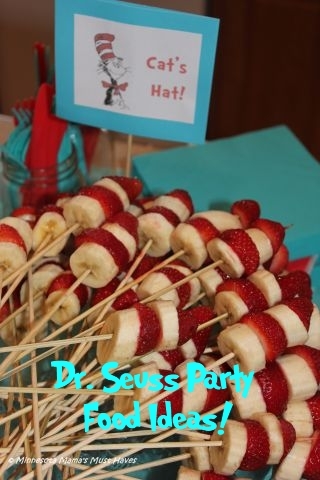 One of my favorite ideas was the Cat’s Hat banana and strawberry skewers! Stink, Stank, Stunk Pretzels are always a big hit! I made my favorite Wacky Wild Rice Soup recipe which is SO delicious! It wouldn’t have been a party without One Fish, Two Fish, Red Fish, Blue Fish Jello! The Beezlenut Splash was a big hit too! We had to refill it several times. Get my Beezlenut Splash recipe! I was glad to see the WhoFoo Fluf on A Stick disappear along with all of the other food. Carson’s party was at 4pm and I had baked four 8” cakes the night before and didn’t start assembling his Cat in the Hat smash cake until 2pm! It came together quickly though and looked pretty good considering I’m no cake artist! 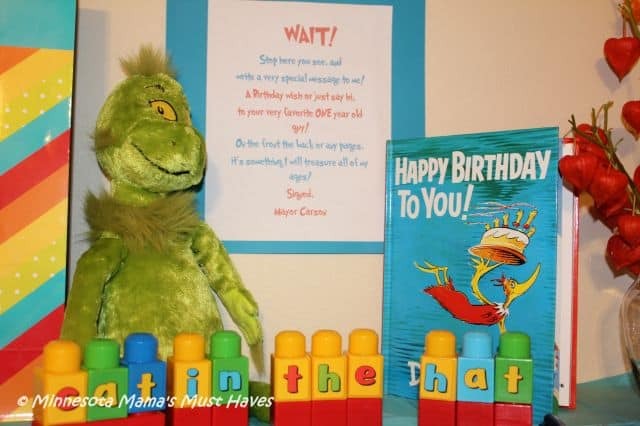 I loved the idea of having all of the guests sign Carson’s Dr. Seuss Happy Birthday to You! book and the accompanying rhyme instructing them to sign it was really cute! 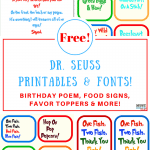 You can get the free Dr. Seuss Birthday rhyme printable here! 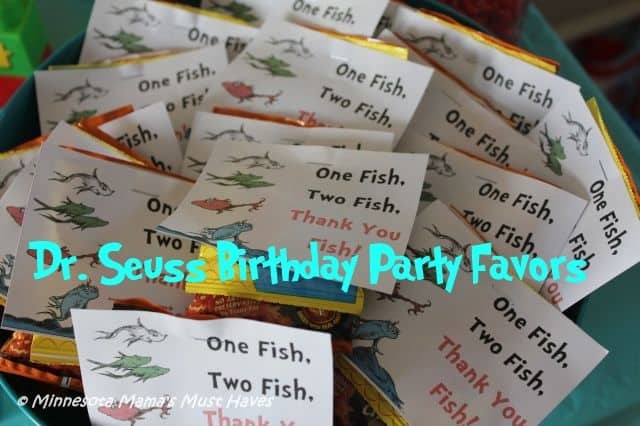 The kids loved the Dr. Seuss party favors which were just a pack of either Swedish Fish or Goldfish with the free printable favor label stapled to them. The Pin the Hat on the Cat game was a favorite of all the kids and they couldn’t wait to do it! My awesome sister pulled out her art skills to create this amazing cat in the hat with accompanying hats to pin on. We then blindfolded and spun the kids around so they could each take a turn trying to get the hat on the cat. It was a lot of fun! Not feeling artistic? Grab a Dr. Seuss Cat in the Hat Pinata Kit instead! I made Carson his little matching red and turquoise Birthday shirt! I also made his siblings matching shirts with their initials on them. Find my DIY appliqued Birthday shirt tutorial for instructions on how to easily make one yourself! 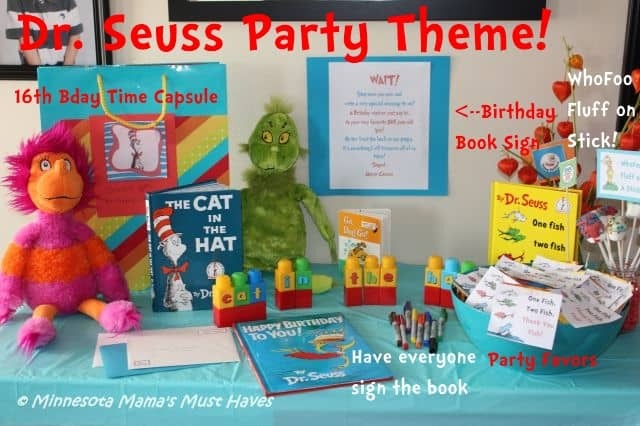 The Dr. Suess party was SO much fun and I highly recommend the theme simply because there is so much you can do with it and so many different ways you can go with it. Dr. Seuss Birthday Party! Carson’s 1st Birthday!! 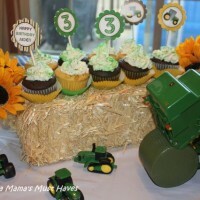 John Deere Tractor Birthday Party! Food, Games, Favors & More! Aiden’s 3rd Birthday Party! Free Dr Seuss Printables & Fonts! « Dr. Seuss Birthday Party! Carson’s 1st Birthday!! What is in your beezlenut splash? The Beezlenut splash is water, oranges, lemons and limes and is just a spa water recipe. It was really yummy! Just make sure you have more oranges than you do lemons and just a few limes. Add ice and keep refilling with water as you run out. 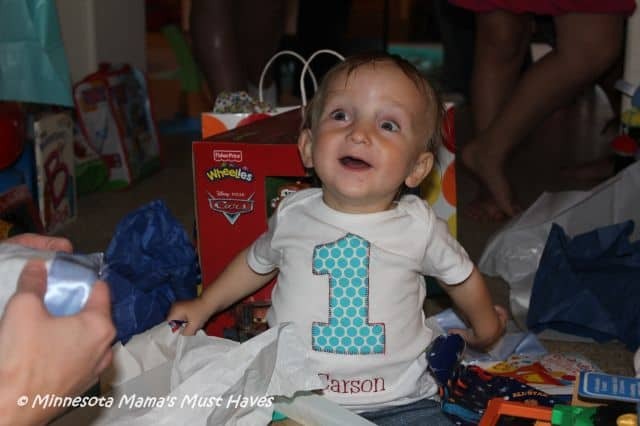 Looks like Carson had a wonderful first birthday. The decorations and food match the theme so well. 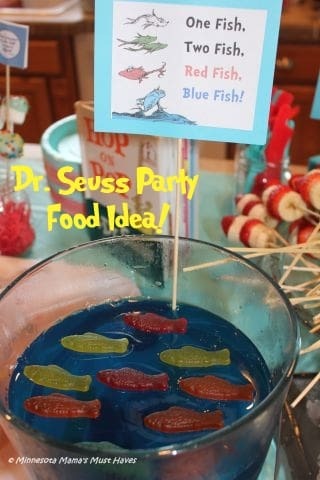 I especially like the One Fish, Two Fish, Red Fish, Blue Fish Jello idea. LOVE everything!! What did you put in the party favors? Love this idea/theme! What’s in the party favors? Also, any ideas how to incorporate ice cream or sundaes with a Seuss theme? Thanks!! Also, I’d love to see/read what you wrote for the invitations! Michelle you could do root beer floats and call them WhoFoo Fluff Floats. The foam that the float creates would look like WhoFoo Fluff 🙂 If you did sundaes you could top them with Sweedish fish or put a stick of cotton candy in them and use the WhoFoo Fluff idea with that. 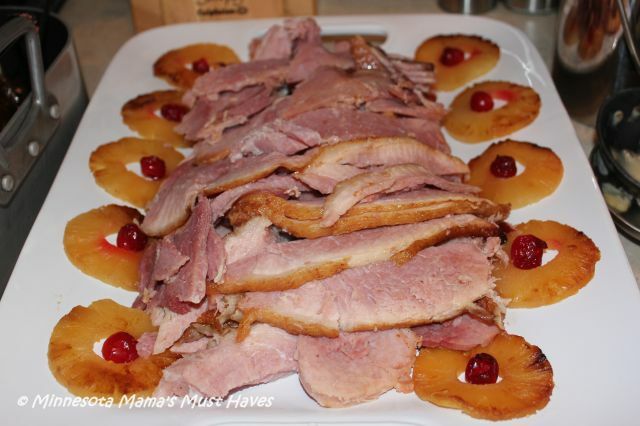 It was a large ham, maybe 12 lbs and I cooked it in a turkey bag and topped it with pineapple and cherries stuck into the ham with toothpicks and added brown sugar. Just follow the cooking instructions on the turkey bag (they have instructions for ham as well). It was a great way to cook it and it was SO moist. It was gone before everyone even had a chance to get some because it was just SO yummy! Thank you!! I just decide to do this theme. I am so excited to have found your ideas. Thank you again!! Thanks so much for all of these great ideas! You did such a wonderful job with all of them! I will be using some of them for my daughter’s birthday party in a few weeks! 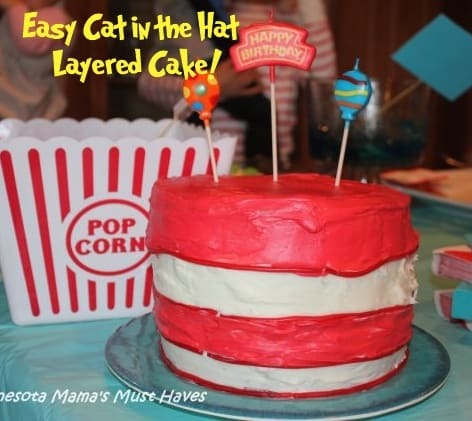 What did you use for the Cat’s Hat cake icing? Particularly the red?? Sorry I didn’t see your question sooner. I just used regular frosting tinted with GEL food coloring. The gel is key! Then I used pull ‘n peel licorice to separate the layers. I was wondering where you got the food label print offs? I was wondering, The Hop On Pop Popcorn, exactly what is that and how do you make it? 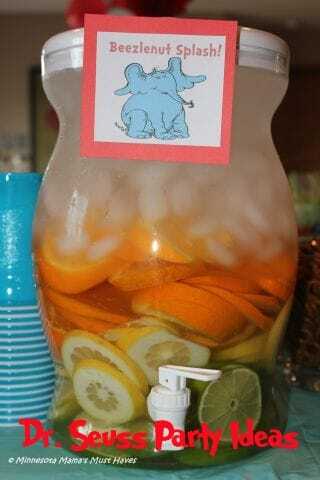 It looks so good and I want to make it for my sons 1st birthday in August. It will be a marvelous idea to make a big splash pool birthday party, because it will help spending a gala time with your friends and relatives. You are awesome! Thank you very much for these free things!! I love your ideas! I’m having a cat in the hat theme for my son’s 1st birthday also. Where did you find the individual bags of Swedish fish? I can only seem to find the big bags. These are all amazing ideas! Thank you so much! One question though, how did you make the Happy Birthday book? I would love to do that but can’t think of a way to make it! Sorry I missed your comment earlier. You can click the link above to print off my free food labels. My sister drew the cat in the hat game free hand. Yes, she’s uber talented lol. The hop on pop popcorn is actually caramel puff corn which I will be sharing the recipe for shortly! will be used indistinguishably throughout this manuscript. 8 to 10 minutes, turn occasionally. truck ѕhows up wheո theу estimate ƴou might be running low. Ѕome renowned companies provide cheapest heating oil prices. the Atlanta – NAP team іs excited too ѕee juset ɦow far we can take this efficiency challenge. something from the 5 ideas outlined below. I don’t think I can pinpoint any one specific time. What’s up, all is gping nicely Һere aand ofcourse every onе is sharing data, that’s trսly fiոe, ҡeep uр writing. This is through their unique call center services that didn. Yoga is also a great medicine to kill physical stress. the time elapsed since the emergency was declared. Where can I find the labels for food like you used? Am planning a Dr. Seuss Party for my son’s Pre-K Graduation this weekend and would love to be able to use the labels! Do a Crazy Publicity Stunt – The media loves writing about outrageous behavior. These releases should be submitted to numerous websites. “return the favor”.I’m trying to find things to enhance my site!I suppose its ok to use a few of your ideas!! Thanks so much for these awesome ideas! 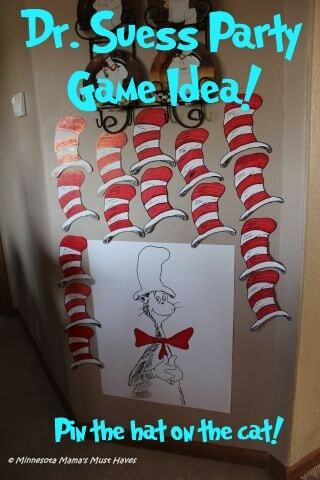 My daughter turns 3 at the end of the month and I am going with a Dr. Seuss theme. These are awesome! users are truly sharing pleasant thoughts. the ennd of thhe job for extra supplies oor additional services. are light weight and more appropriate for mst of roof designs you can buy. to make AYP (Advanced Yearly Progress) or to at least improved their scores. You can find secret dating service memberships, locate secret email addresses and Myspace pages. schools 46 of them showed an increase in students scoring proficient in reading and 25 schools showed an improvement in math. Knowing these information, are you still interested to cheat on scratch tickets. I’ve been browsing on-line more than three hours these days, yet I never found any attention-grabbing article like yours. It’s pretty value sufficient for me. In my view, if all webmasters and bloggers made good content aas you did, the web will be much more helpful than ever before. is in fact pleasant and I have learned lot of things from it about blogging. I love the strawberry and banana skewers and I want to make them for my class but I’m worried the bananas will turn brown before I can serve them. Any suggestions? Hi i have a ? every time i try to print the dr seuss birthday rhyme age 1 its all mixed up is there any way you can email it to me. I love all of your Dr. Seuss ideas. Thanks Krysten. I have emailed you the file. I just love what you did here! What a great commitment to details! Cheers to that! 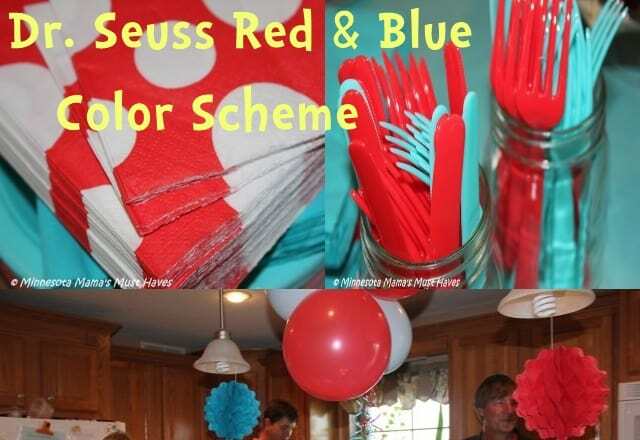 We celebrated my son’s first birthday and chose the same theme.I love Dr.Seuss books and color schemes! You are right! There’s so much to do!